Modrons were introduced to AD&D starting with the Monster Manual II, and quickly earned a reputation among some players as being, stupid, useless, or both stupid and useless. Their creation was supposed to have been inspired by the novella Flatland, in which modrons would probably be classified as inhabitants of Spaceland. I became interested in them only recently, after listening to the audiobook version of The Metal Monster by Abraham Merritt. In the story, a group of pulp era adventurers encounter an enclave of sentient metal beings in the Himalayas. The description of their city with marching ranks of metallic beings really evoked the imagery of modron society for me. 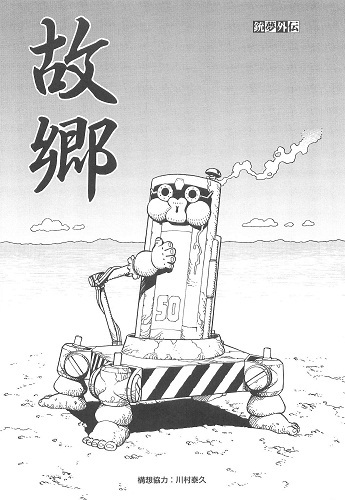 If I ever use modrons in a game, I plan on basing them after the Metal People from the novel. The three forms of the Metal People are sphere, cube, and pyramid (analogous to monodrone, tridrone, and quadrone). 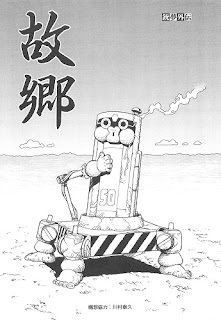 The rulers of the Metal People are dubbed "The Metal Emperor" and "The Keeper of the Cones", and can be likened to heirarch modrons (although unlike heirarch modrons, they are just larger versions of the base forms). The ability of these metallic beings to join together as a gigantic metal monster is a feature that I would add to the otherwise lackluster repertoire of modron special powers. In any event, the D&D Miniatures Icons of the Realms line contains three modron figures - the Monodrone (Tomb of Annihilation #10), the Duodrone (Tomb of Annihilation #19), and the Quadrone (Monster Menagerie III #18). In the Monster Manual II the monodrone is said to be small in size, and about 3½ feet [tall?]. The specifications are not clear, but if the stated size refers to the diameter of the body, it would be fairly close to 1/72 scale. I decided to convert one of my monodrone figures by giving it the arms from a duodrone. 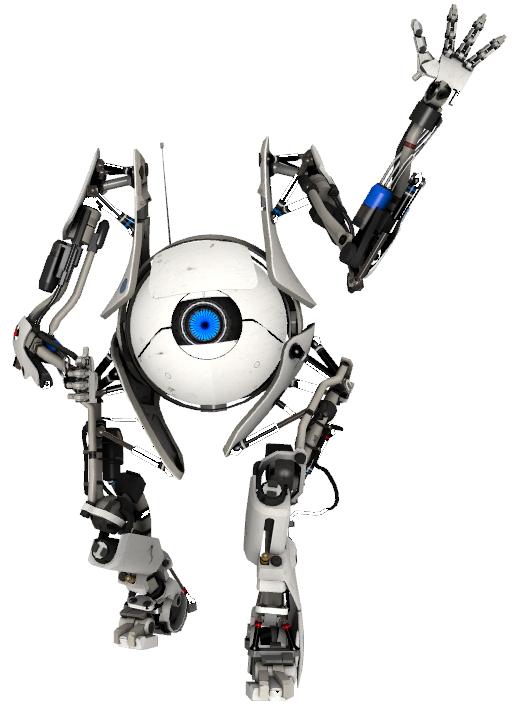 It reminds me a bit of Atlas from Portal 2. The original duodrones were rectangular in shape and stated to be 4½ feet long. The current duodrone is shaped like a barbell, and has a face that looks like the deckman robots from Battle Angel Alita. I'm not a big fan of the duodrone in general, and cut the figure up to use as parts for conversions. Quadrones are listed as being medium size, but typical illustrations show them being roughly similar in size to monodrones. This is also reflected by the size of the miniatures. I took the duodrone that I cut up, and made it into a quadrone. The plastic that these miniatures are made of responds amazingly well to CA glue. Based on canonical D&D art, I would say that these figures are too big for 1/72, and the monodrone is probably over-sized even for 28mm. 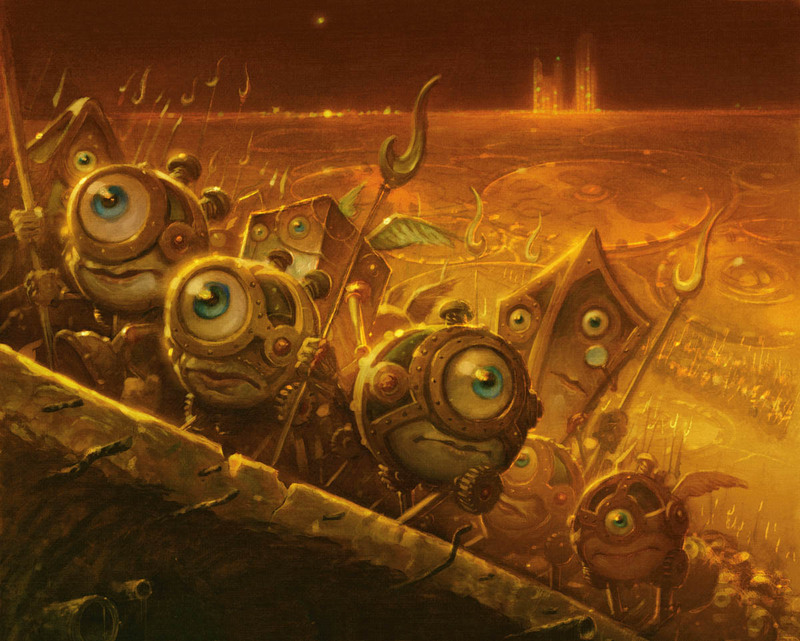 It's not an issue for me though, since I am open to having modrons of different sizes, and will blend my modron backstory with that of the Metal People from The Metal Monster. 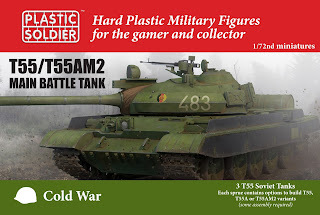 PSC released their first 1/72 modern tank model in the form of the T-55 as part of a "willstarter" pre-order program (200 pre-orders and they will produce the kit). These are quick build models designed for wargaming, with three tanks in every box. Optional parts allow you to make the T-55 (Soviet or Polish), T-55A (Soviet, Czech, or Polish), or the T-55AM2. The details on the parts are on the chunky side, giving the models a toyish look. Also, if you look closely at the parts, you can see layer lines, suggesting that the original pieces were probably created using 3D printing technology. The tracks are pretty disappointing, and I'm not sure that there is any easy way to make them better looking. The rear drive sprockets also look to be somewhat oversized. The turret is missing the ports for the coaxial machinegun and telescopic sight. There is also no IR searchlight for the commander's cupola (if anyone with the 15mm version of this kit wants to sell their extra searchlights, please contact me - I think they might work perfectly as the commander's searchlight in 1/72). The rivets on the cupolas are enormous, and the DShK is very chunky. I also don't think that the T-55A loader's hatch is correct for the Czech version. 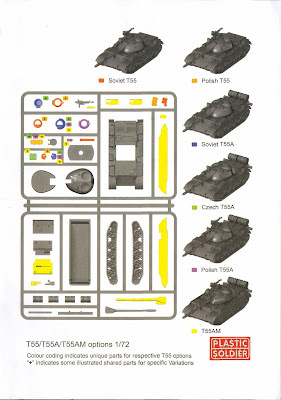 In most of the pictures that I found, the hatch was more like the one designated for the T-55 in the instructions. The loader's hatch cover also seemed to be rather unusual, being particularly thick, and with a lip around the edge. The round shape seems okay, but most pictures seem to show that the cover is either flat or slightly domed. For some tanks, the cover was also more "D" shaped, but there was no option for this type of hatch cover in the kit. Since my plan was to build a T-55A of the Sri Lanka Armoured Corps, I decided to start off by modifying the loader's hatch cover to reflect this appearance. I used a circle template and etched an arc with my scribing tool. The arc should have been wider, so I had to file it down to a flatter shape after I cut the cover in two. I also thinned the plastic down a bit, though it's probably still too thick. After that, I assembled all the major parts of the tank (which probably took less than 10 minutes), then took some comparison shots with a Hobby Master T-55A (HG3315). As far as the two tanks compare, the hull of the Hobby Master tank is about 1mm wider, but they are pretty much the same length. The PSC tank actually looks shorter, but this is due to the turret being set further back on the hull so that the barrel of the cannon is 2mm further back. The Hobby Master tank has a rounder turret, while the PSC tank has a more egg-shaped turret. I do not know which one is more accurate. Despite the various deficiencies that I mentioned earlier, I still think the PSC models are well worth getting. 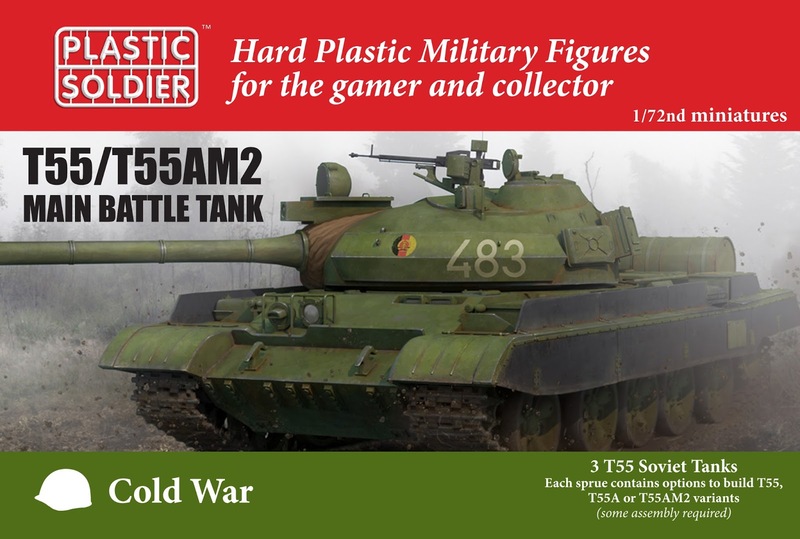 They are sturdy models that are great for wargaming, and definitely look the part of a T-55. There are a lot of spare parts, and the D10T barrel is particularly nice (it really comes in handy if you have any Ace T54/T55/Type59 models with their poorly shaped guns).